يقع InterContinental على ضفاف نهر Torrens بجوار مركز Adelaide Festival ومركز مؤتمرات وكازينو أدليد، وتوفر جميع الغرف والأجنحة إطلالات رائعة على المدينة وتضم حمامًا فاخرًا من الرخام. 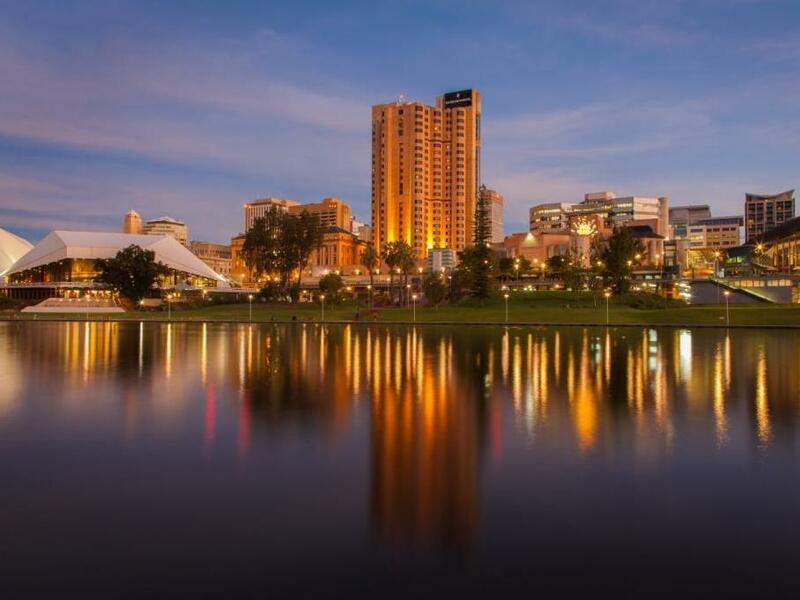 يمكن لضيوف Adelaide InterContinental تناول الطعام في مطعم Riverside المميز التابع للفندق أو الاستمتاع بالمأكولات يالابانية الحائزة على جائزة في مطعم Shiki، ويقدم كلا المطعمين قائمة نبيذ شاملة تشتمل على مجموعة مختارة من نبيذ أدليد الحائز على جائزة. توفر صالة الأتريوم أجواء أنيقة وهادئة مثالية لتناول الشاي بعد الظهر أو الكوكتيلات أو المشروبات في وقت متأخر من الليل، كما تقدم الترفيه الحي طوال عطلة نهاية الأسبوع، ويقع نادي InterContinental في الطابق 21 ويوفر دخولاً خاصًا للصالة الخاصة. تم تزيين جميع غرف وأجنحة الفندق البالغ عددها 367 بشكل جميل، وتضم منطقة عمل فسيحة ومُصممة بأسلوب مريح مع خدمة الإنترنت عالية السرعة، وتشتمل جميع الحمامات الفسيحة على حوض استحمام منفصل ومقصورة دُش. يحتوي مركز InterContinental للصحة واللياقة البدنية على جيم كامل ويوفر تدريب شخصي عند الطلب ويضم مسبحًا ساخنًا في الهواء الطلق، ويمكن لمكتب الجولات السياحية الواقع بالفندق المساعدة في حجز الأنشطة المحلية والأحداث الفريدة في مدينة أدليد. يمكن للنزلاء طلب نوع الأسرّة المفضل في خانة الطلبات الخاصة عند الحجز. ويرجى ملاحظة أنه لا يمكن ضمان توفر نوع الأسرّة المفضلة، وسيتم تأكيدها عند الوصول بحسب التوافر. يرجى ملاحظة أنه قد يتم تطبيق سياسات مختلفة بالنسبة للأسعار الشاملة للإفطار، وقد يتم فرض رسوم إضافية على النزلاء الإضافيين. يرجى ملاحظة أنه يتم فرض رسوم بقيمة 1.5% عند الدفع بواسطة بطاقات ائتمان فيزا أو ماستر كارد. يرجى ملاحظة أنه يتم فرض رسوم بقيمة 3% عند الدفع بواسطة بطاقات الائتمان أمريكان إكسبريس أو داينرز كلوب. The stay didnt start well as my toilet flush wasnt working. The local team has addressed my concern, moved me to a new room and we’ve agreed amicably on the resolution. It was overall a good stay. Really nice staff esp in the Club. We stayed for one night as we are from the country and had a show on at the Festival Theater which was a 30 second walk from the hotel. The service was second to none, we had a mishap with our meals and they refunded the full total and re-made the meal and even offered us complimentary cocktails. We highly recommend and we will be sure to stay again! Pros - Checking in process was excellent, Location excellent in CBD & tram to Glenelg at front door, Clean rooms, Extras in rooms eg slippers, robe & free toiletries. Food for Room Service fast & tasty Cons - Music from Casino very loud until 2am Sun morning even though we were on 20th floor, so advise you ask for room at back of Hotel. Great Location, excellent comfy room, most staff were brilliant except upon checking out the valet staff member was a flog! He was quite rude and couldn't be bothered helping us with our baggage, he just on looked from a distance. Was upgraded from river view king room to a suites but regretted... the suite is facing building or parking lots. Close to everything. Very clean and very obliging staff bend over backwards to help. Breakfast was great and variety. There was 11 if us and we all days we would stay here again and recommend it to people we knew. We haven't stayed at the InterCont for a while, but tried it as our regular hotel was booked out. The location is perfect and the breakky which we got included was excellent selection and quality. The rooms are looking a bit tired and probably in need of a facelift, but the rooms were clean and spacious. I'd stay again. Staff were very accommodating and the room was upgraded to suit me and 2 kids on the spot. Kids really loved the room, and all the nearby activities, especially the park by the lake. I'll be staying there each time i visit from now on. I stayed for a couple of nights, my second visit to this hotel. The restaurant is good, although not cheap. I used the gym and was the only person in there mid/late afternoon. Its a good location to walk to nearby shops and restaurants. Expensive wifi (as is often the case in New Zealand)... I assume they will catch up and provide free wifi soon! I booked this hotel for my parents. I made a note that it was my dad's doctorate graduation, along with arriving early in the morning (7am). they were so accomodating, not only having managed to let them checkin to their room when they arrived, but also gifted a bottle of sparkling wine! My parents were so happy, customer service was great! Thank you for making my parents stay in Adelaide so comfortable and pleasant! Your check-out staff obviously need better training to understand simple tasks, like direct debit or credit. When stated that I wish to have my bill direct debited from my account the female staff member completely ignored by request, and I was subsequently charged the tax on my bill. Not happy Jan!!!! Thoroughly enjoyed our stay. Everything was perfect including the Oz Asia Festival, literally outside 'our door'. Such friendly, smiling, attentive staff. Thank you. no complain. None. Great stay. Not something we’d do all the time but fantastic for a special occasion.